BIOMagic™ probiotic combines multiple species, from both Lactobacillus and Bifidobacterium genera, in order to provide more comprehensive support for the complex microbiome of the human gut than typical single-species products. Each species occupies a specific niche with some preferring conditions in the small intestine while others may thrive in the colon, genitourinary tract, or elsewhere in the body. Unlike many probiotics, this formula does not contain Streptococcus thermophilus or Lactobacillus bulgaricus, strains known for use as yogurt culture starters and known to upset sensitive digestive systems. Instead, BIOMagic™ includes Lactobacillus plantarum, a species that may help support healthy mucosal cells in the genitourinary tract and oral health, and Bifidobacterium infantis, a natural resident of the human intestinal tract that may be especially important for supporting digestive comfort and immune health. Which Strains Are Included? 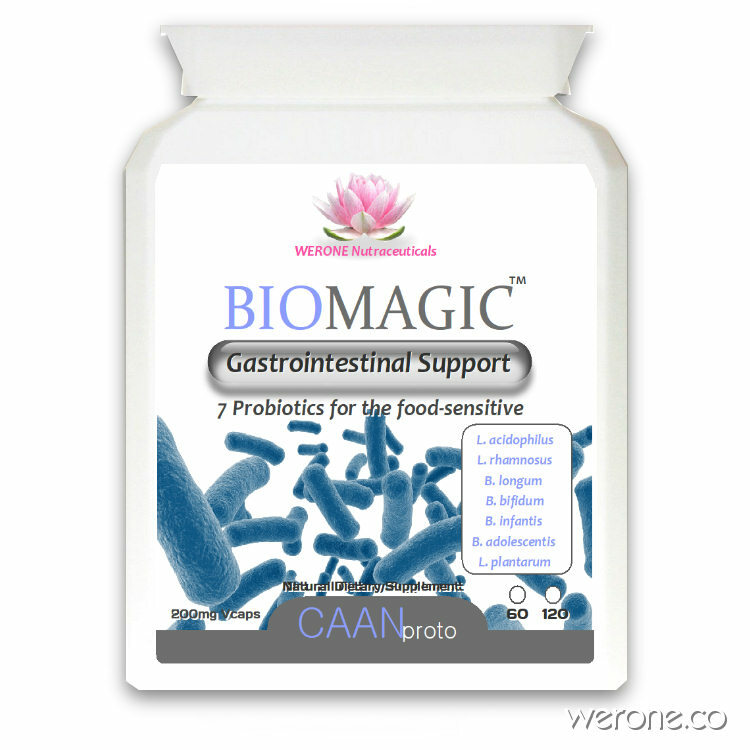 – The formula contains Lactobacillus acidophilus and Bifidobacterium bifidum, bacteria found naturally in the human intestine. They are complimented by 5 additional bacterial strains – L. rhamnosus, B. longum, B. infantis, B. adolescentis, L. plantarum all known to be compatible with people who have sensitive digestive systems and histamine issues. Can the Bacteria Survive Stomach Acidity? – Some strains of live bacteria cannot survive the stomach acid and are killed off before being able to provide any benefit. Nutri have chosen only the strongest strains that have been rigorously tested, and shown to survive the digestive process – including stomach acidity. Probiotic Plus is suitable for those with no functional gut issues. Those with any gut health issues would, in most instances benefit greatly from higher dose formulas. The capsule does contain gelatin, but if the capsule is removed is suitable for vegetarians and vegans. Lactobacillus or Bifidobacteria have the ability to decrease viral infection by establishing the antiviral state in macrophages, by production of NO and inflammatory cytokines such as interleukin 6 and interferon-gamma. Probiotic mixtures have been found to be helpful in various immune disturbances including ME/CFS. Minimum 750 million live microorganisms per capsule. Store in a cool dry place – no need to refrigerate. BIOMagic™ is a completely safe live bacteria food supplement, has no contraindications and carries no risk of overdose. BIOMagic™ live bacteria capsules can be pulled apart and the contents sprinkled on to food, mixed in a drink or swallowed whole. Take 2-4 capsules daily, ideally at a different time of the day from the antibiotics. Children under 12 – half adult dose. Don’t waste your time and money buying supermarket probiotics drinks or yogurts, this is a brilliant supplement for digestive health without all the dairy and extra unnecessary calories, great product, great value and quality brand! Cruciferous vegetables help speed up phase 2 of the liver conjugation pathway. This involves converting the fat-soluble toxic chemical and transforming the toxins into water-soluble chemicals. Then they are passed out through body fluids as such as the bile or urine. MEGAGreens™ is a unique, all-natural combination of vegetables, herbs & their minerals specially formulated to help the body detoxify harmful toxins. Bragg's Charcoal Tablets provides 100% natural relief for indigestion, wind, heartburn and chemical detoxing. It can also be taken during pregnancy and lactation. It alleviates the symptoms of Dyspepsia (chronic or recurrent discomfort in the abdomen accompanied by bloating, belching, nausea) offers relief from occasional diarrhoea, is wheat and lactose free. Bragg’s contains activated Charcoal has been used for many years in the treatment of intestinal disorders.